A rare blonde zebra was discovered frolicking at Serengeti National Park in the first-ever documented wild sighting of the animals’ paler counterpart. The animal was caught by photographer Sergio Pitamitz, who was hoping to snap pictures of migrating Zebras when he noticed something unusual. ‘At first I thought it was a zebra that had rolled in the dust,’ Pitamitz told National Geographic, whom he is a photographer for. Shortly thereafter, however, he realized what he had stumbled upon. Pitamitz’s subject was a ‘blonde’ zebra which according to experts likely has albinism, a condition that means the animal has less melanin in their skin theretofore giving them a lighter, sometimes blonde, pigment. While other albino zebras have been observed in captivity — including one at Mount Kenya National Park and another at a sanctuary in Hawaii — this is the first specimen to be documented in the wild. Little is known about zebras and albinism, but researchers say the rare pictures of the blonde varietal confirm for the first time that they are accepted into herds of their ‘normal’ colored kin. When it comes to what affect the zebras abinism might have on other aspects of their life, however, the stakes may be slightly higher. 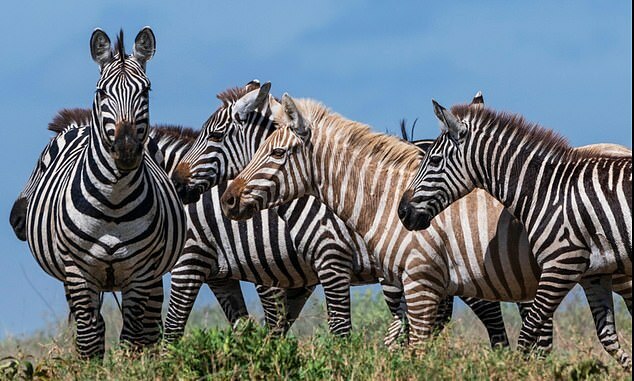 A zebras stripes, according to research, work to ward off hoards of biting flies that the animals come in contact with on a daily basis and without the protection blonde zebras may be more vulnerable. Though rare, the blonde zebras aren’t alone in the animal kingdom, albinism has been documented in a variety of other species including giraffes, penguins, orangutans, mice, humans and more. 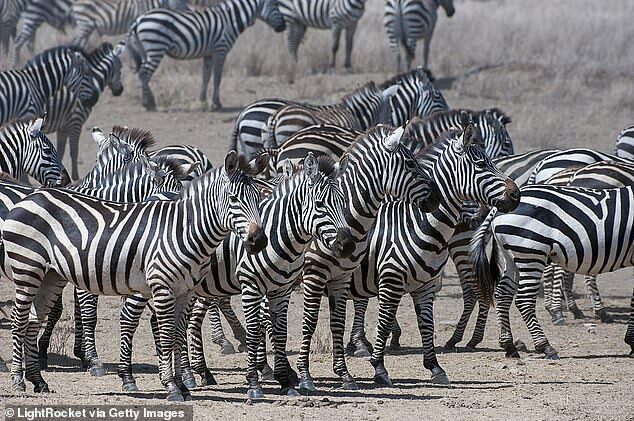 Even among non-albino zebras, stripes and patterns vary. Some zebras have spots or extra stripes and according to researchers, every animal’s pattern is unique. WHAT ARE THE THEORIES BEHIND WHY ZEBRAS HAVE STRIPES? There are several possible explanations as to why zebras have black and white stripes, but a definitive answer remains to be found. There are a number of theories which include small variations on the same central idea, and have been divided into the main categories below. The areas of research involving camouflage and social benefits have many nuanced theories. Stripes might also be visual markers for group bonding or to direct companions to particular parts of the body for grooming. Anti-predation is also a wide-ranging area, including camouflage and various aspects of visual confusion. These explanations have been thoroughly discussed and criticised by scientists, but they concluded that the majority of these hypotheses are experimentally unconfirmed. As a result, the exact cause of stripes in zebra remain unknown.